JARVANIA faucet filters have 5-stage filter cartridge, filter out heavy metals, cysts, pollutants, and other contaminants, improving the taste of your water and protecting you from harmful contaminants. Easily switch between purified water outlet and normal water outlet. Smooth operation, easy to use. JARVANIA faucet water filter extremely benefit you and your family's health. It increases pH & ORP, ionizes and softens hard water, removes free radicals, adds beneficial minerals like zinc, calcium & magnesium, offering you healthier water. The following is the faucet that can not install the water purifier. Please distinguish carefully so as not to cause inconvenience. 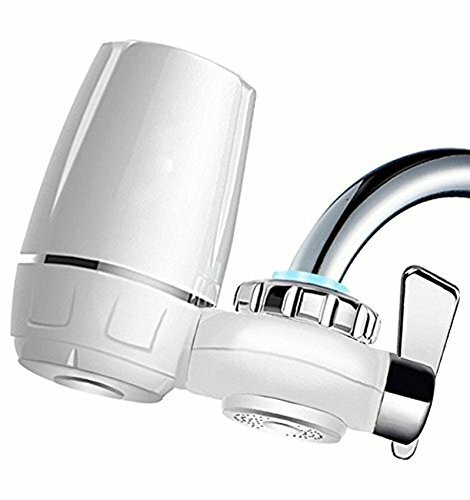 【Health Benefits】JARVANIA faucet water filters are able to remove 99% of lead and 96% of mercury from water, removing a large number common contaminants. The water filters system filters out the peculiar tastes and odors in water for a refreshing, clean water taste, which supports anti-aging and helps to maintain optimal health. With JARVANIA faucet water filters users can protect the health of themselves and their loved ones by removing hazardous materials from your water. 【Superior 5-stage Filter Cartridge】 JARVANIA tap water filter gives five levels of filtration：Diatom ceramic, calcium sulfite, coconut shellL activated carbon, medical stone, tourmaline and PP cotton. effectively removing chlorine, chloramine, fluoride, bacteria, pesticides, viruses, colloids, fungi, chemicals, heavy metals including arsenic, lead, mercury & aluminium, while balancing pH and retaining beneficial minerals. 【Uncomplicated to Install】 JARVANIA faucet filter fits most standard taps. The simple design makes it simple to activate and operate. Just assemble the water filter according to the instructions and install it on the faucet, so users will enjoy the clean, good tasting water at home. The tap water filter also has a transfer switch that can be easily switched from filtered water to regular tap water. 【Worry-Free Warranty】At JARVANIA, we provide the water filter an 12-month warranty and offer friendly, easy-to-reach support. If you have any problems with the tap filter , please feel free to contact us and we will respond in 12 hours. If you have any questions about this product by Jarvania, contact us by completing and submitting the form below. If you are looking for a specif part number, please include it with your message.